Your Customers Use Their Phones More Than You Think. It’s true. Look at this graphic. It tells a very compelling story. Consider the interval from July 2014 to July 2016—nearly a 10% shift in two years of customers gaining more information about the items they buy—all from their smartphone. The retailers that have prepared for this shift will occupy the marketplace more quickly and permanently than their competitors. Those that embrace this technology will become marketplace leaders. 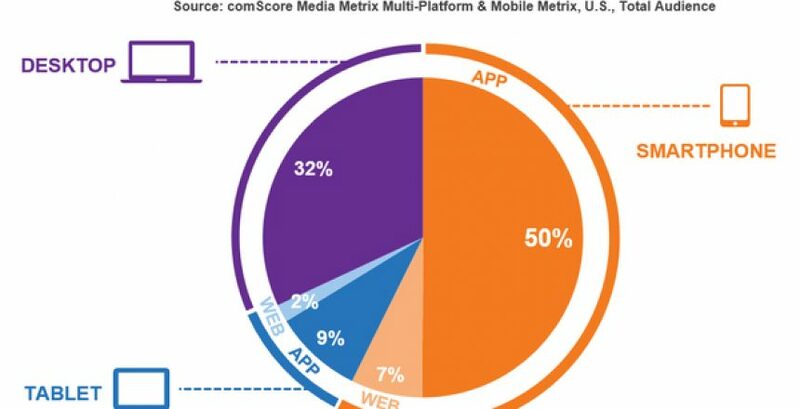 Customers Use Smartphone Apps More Than Websites and Other Devices. Potential customers like the fact that they can get what they want—easily. They don’t have to navigate websites from a desktop computer or on their phone. The app provides simplicity and ease of use. It’s also fun! The smartphone app allows potential customers to leverage their time. Ask yourself this question: “If my customer was looking at my store in his/her free time, would it likely coincide with their use of their smartphone or a desktop computer?” Clearly, the smartphone wins. A smartphone is generally within a few feet of us. By providing an app, you make it easier to do business with your store. They don’t have to wait to access their clunky laptop or desktop computer. Companies in other industries have already acknowledged this shift. That’s why you see large retailers courting their customers this way. Don’t you think it’s time that you do the same? Call Us. Now. Grow Your Business! Our Mobile Marketing Specialists can help you make this reality—easily. We’re here to show you how BOTTLECAPPS can make a difference in your business. Your Store. Your Customers. Your App. Call 469.420.9447 to secure your store’s future. Download our demo app by clicking the links below!